CAITLIN IS ON THE COUCH, WATCHING FINDING BIGFOOT. BRENNAN ENTERS, STAGE LEFT. Brennan: You should really read a couple of John Green’s books. I think you’d like them. Brennan: Well, yes. But that really just means that his books are about teenagers, not exclusively for them. Caitlin: I don’t know. I don’t really like all that sappy, romance stuff. Caitlin: You know, like Nicholas Sparks. Why my wife, who has claimed in the past that I enjoy only terribly dark and depressing art, would think that I’ve suddenly become wrapped up in “sappy, romance stuff” or Nicholas Sparks novels is beyond me. It’s also inaccurate. And, with all due respect to the fabulously wealthy Mr. Sparks, a bit insulting to Mr. Green whose works deserve a bit of a buffer from the likes of A Walk to Remember and Dear John. That said Will Grayson, Will Grayson (which was co-written, half-and-half style, with David Levithan) may come the closest of any book in the Green oeuvre to matching Caitlin’s ideas of a teen novel: it’s filled with fleeting romances, silent treatments, and copious amounts of text messaging. The novel’s premise is an intriguing one: on a cold Chicago street, as their entirely-separate-up-until-now social lives seemingly fall apart, one Will Grayson meets another, very different, Will Grayson. Same-name shenanigans ensue. Except that their same-namedness is not a particularly important plot point once the Will Graysons get past introductions. It’s their vaguely-existentialist teenage drama that drives the story. Questions of Who am I? How can I be happy? and Does he/she like me? keep the narrative moving and, combined with Green & Levithan’s excellent voicing, remind how simultaneously troubling and rewarding the high school experience can be. The book’s ending may be a bit syrupy and over the top, though – as with any destination worth reaching – it’s the journey that carries you. The Wills Grayson endure ups and downs both personal and private and, of course, learn a great deal about both themselves and those around them. Like any self-respecting teen novel, there is crushing loneliness and exuberant romance and, most importantly, the needed counterweight of (often self-deprecating) humor. There is expert writing, too. My personal favorite? Green uses the Schrödinger’s Cat thought experiment as a metaphor, to masterful effect. Specifically, the Cat is used to describe one particular romance while, in a broader and more significant sense, it is applied to adolescence and personal growth as a whole, imploring the shy and bookish among us to take an active role in our own lives. Due to the short length of the book and the large number of characters within, a few of the story’s participants are not as fully three dimensional or wholly original as they might have been (when reading about Tiny Cooper – who’s getting his own book next year – it’s hard not to think of Mean Girls‘ Damian, for example). There just isn’t enough time or space to fully flesh everyone out. And yet the story works anyway because, like with a lot of teen novels, the story isn’t so much about those characters as it is about you, the reader. 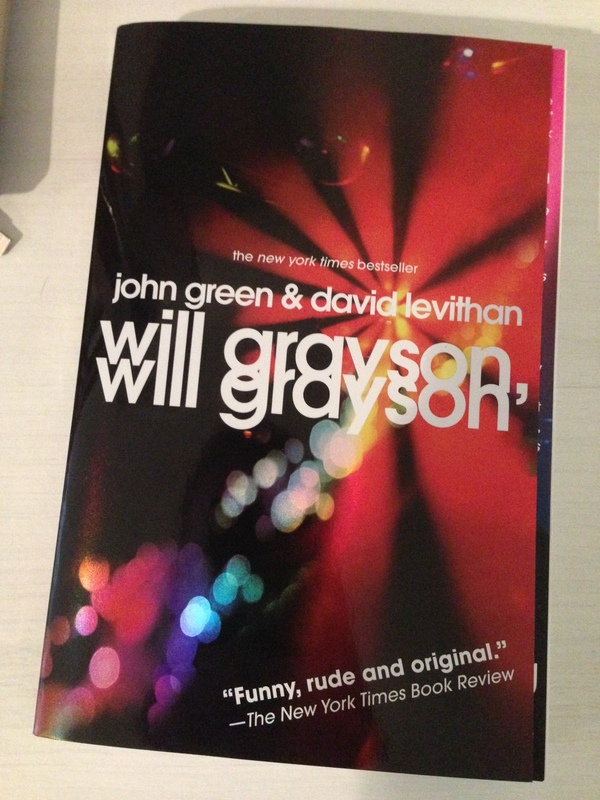 Despite its shortcomings and imperfections, Will Grayson, Will Grayson is a worthy read. I imagine that even Caitlin, and her odd notions of young adult fiction, would enjoy it if she gave it a chance. If you like what you're reading, enter your email address below. You'll be notified of new posts by email.